Will student's prom proposal lead to federal charges? 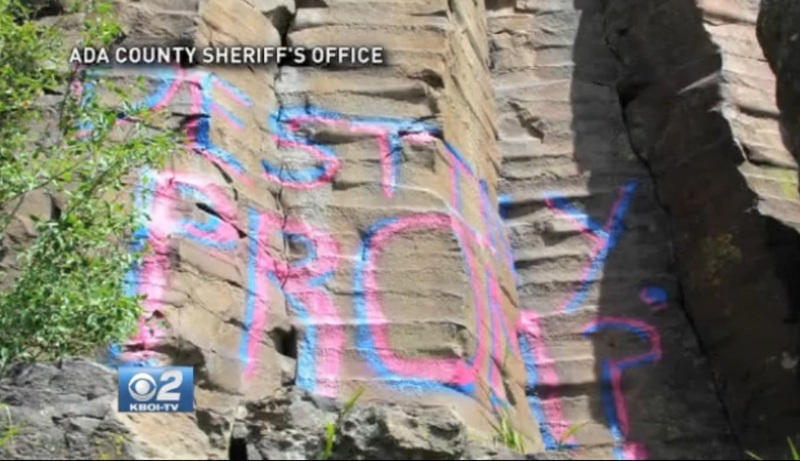 ADA COUNTY, Idaho -- Authorities are looking for a teen seeking a date with Destiny and hoping to get it by spray-painting a prom proposal on an Idaho cliffside. The Idaho Statesman reports that the message "Destiny, Prom?" was spray-painted in large pink and blue letters on the side of the Black Cliffs, in a popular rock climbing spot, east of Boise. The Ada County sheriff's office is searching for the culprit. The prom pursuer could face a misdemeanor charge of "injury by graffiti," which is punishable by up to six months in jail and a fine of $1,000. A federal charge also is possible because the U.S. Bureau of Land Management owns the area. The culprit also would be responsible for the cost of cleanup. The area is also culturally significant land for Native Americans, reports CBS affiliate KBOI. "We realize prom proposals are a big deal these days but this one was just a really bad -- and illegal -- idea, which caused some serious aesthetic and cultural damage," said Patrick Orr, a spokesperson for the Ada County Sheriff's Office. Investigators say the next step is to talk to school resource officers to try to figure out who's responsible. "Hopefully that person will just come forward," Orr said. Orr added that the cleanup will require a lot of work. "It's probably about eight feet tall, it's a pretty significant amount of spray paint. It's permanent, it's not going anywhere anytime soon," he said. Meantime, the cliff communicator just hopes he's going to the prom.